Welcome to Delmae Heights Elementary School! Florence One Principal of the Year! Delmae Heights Elementary School prides itself on being a school where “Kids and Character Count!" Our staff strives for academic excellence for all students through a program of instructional excellence which includes both staff development for teachers, and classroom instruction in the areas of ELA, Math, Science, Social Studies, STEAM and the Related Arts. 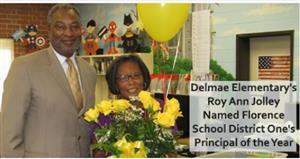 Delmae is an AdvancEd certified STEM School! 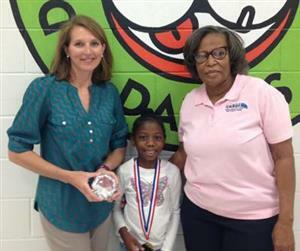 FLORENCE, S.C. – Maliyah Daniels, a kindergarten student at Delmae Heights Elementary School, has been named the state grade level winner in the National Zaner-Blozer Handwriting contest. BIG NEWS for all Florence One Students in Grades 3 - 5! ALL students in Florence One Schools in grades 3-5 will soon be going 1:1 with Chromebooks! On November 12th your child will be issued a Chromebook, a charger, and headphones. In order to engage parents, we will be hosting several informational sessions. Please plan to attend one of these sessions. All parents must attend a session to sign the revised F1S device guide. We ask that you review this prior to attending the informational sessions. The links to the F1S Device Guide and invitation are below. We are so very excited about this initiative that will transform teaching and learning in our schools! Imagine Forward with F1S! Please plan to attend one of the sessions offered. Thanks! There has been a change for our first grade car riders. Beginning Monday, October 8th, all first grade students should be dropped off in the mornings and picked up in the afternoons in the Kindergarten carline.